A new study from MIT scientists suggests that the guidelines governments use to determine when to evacuate people following a nuclear accident may be too conservative. The study, led by Bevin Engelward and Jacquelyn Yanch and published in the journal Environmental Health Perspectives, found that when mice were exposed to radiation doses about 400 times greater than background levels for five weeks, no DNA damage could be detected. Current U.S. regulations require that residents of any area that reaches radiation levels eight times higher than background should be evacuated. However, the financial and emotional cost of such relocation may not be worthwhile, the researchers say. Until now, very few studies have measured the effects of low doses of radiation delivered over a long period of time. This study is the first to measure the genetic damage seen at a level as low as 400 times background (0.0002 centigray per minute, or 105 cGy in a year). Almost all radiation studies are done with one quick hit of radiation. That would cause a totally different biological outcome compared to long-term conditions, says Engelward, an associate professor of biological engineering at MIT. Background radiation comes from cosmic radiation and natural radioactive isotopes in the environment. These sources add up to about 0.3 cGy per year per person, on average. 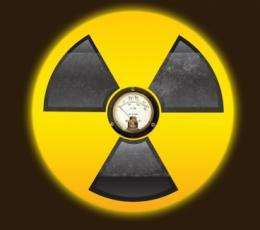 Exposure to low-dose-rate radiation is natural, and some people may even say essential for life. The question is, how high does the rate need to get before we need to worry about ill effects on our health? Yanch says. Previous studies have shown that a radiation level of 10.5 cGy, the total dose used in this study, does produce DNA damage if given all at once. However, for this study, the researchers spread the dose out over five weeks, using radioactive iodine as a source. The radiation emitted by the radioactive iodine is similar to that emitted by the damaged Fukushima reactor in Japan. At the end of five weeks, the researchers tested for several types of DNA damage, using the most sensitive techniques available. Those types of damage fall into two major classes: base lesions, in which the structure of the DNA base (nucleotide) is altered, and breaks in the DNA strand. They found no significant increases in either type. DNA damage occurs spontaneously even at background radiation levels, conservatively at a rate of about 10,000 changes per cell per day. Most of that damage is fixed by DNA repair systems within each cell. The researchers estimate that the amount of radiation used in this study produces an additional dozen lesions per cell per day, all of which appear to have been repaired. Though the study ended after five weeks, Engelward believes the results would be the same for longer exposures. My take on this is that this amount of radiation is not creating very many lesions to begin with, and you already have good DNA repair systems. My guess is that you could probably leave the mice there indefinitely and the damage wouldnt be significant, she says. Doug Boreham, a professor of medical physics and applied radiation sciences at McMaster University, says the study adds to growing evidence that low doses of radiation are not as harmful as people often fear. Most of the radiation studies on which evacuation guidelines have been based were originally done to establish safe levels for radiation in the workplace, Yanch says  meaning they are very conservative. In workplace cases, this makes sense because the employer can pay for shielding for all of their employees at once, which lowers the cost, she says. However, the researchers say that more studies are needed before evacuation guidelines can be revised. Clearly these studies had to be done in animals rather than people, but many studies show that mice and humans share similar responses to radiation. This work therefore provides a framework for additional research and careful evaluation of our current guidelines, Engelward says. It is interesting that, despite the evacuation of roughly 100,000 residents, the Japanese government was criticized for not imposing evacuations for even more people. From our studies, we would predict that the population that was left behind would not show excess DNA damage  this is something we can test using technologies recently developed in our laboratory, she adds. The first author on these studies is former MIT postdoc Werner Olipitz, and the work was done in collaboration with Department of Biological Engineering faculty Leona Samson and Peter Dedon. These studies were supported by the DOE and by MITs Center for Environmental Health Sciences. LNT can be falsified. Show that a photon (above ionizing energy range) can't ionize a cell molecule. In this study, as authors state, it is possible that the degree of damage is less than the detection sensitivity. That is likely, because of the small number of mice used. Even according to LNT the excess cancer risk associated with the delivered dose is only a 1% risk increase. Show that a photon (above ionizing energy range) can't ionize a cell molecule. This is a massive red herring; you know as well as I do that this is not where doubt in the LNT hypothesis is focused and not where any errors are likely to lie. The body has repair mechanisms, and they are anything but simple and linear. If a DNA chain has a double stranded break in only one location it is much more likely to be correctly repaired than if it has been smashed in 20 pieces. Your body has the ability to upregulate repair mechanisms in response to stresses(hence why strenuous exercise is not a potent carcinogen). No, that is a massive red herring. The body does not repair with 100% accuracy, 100% of all lesions. If it did, that would also falsify LNT. But it doesn't. I probably should ascribe that to a failure of reading comprehension rather than malice, but I struggle to do it. You don't need to successfully repair all errors. At high dose rates(e.g. 100 mSv in ~10 seconds as Hiroshima) the repair mechanisms are totally overwhelmed and there are many concurrent errors that need repairing; at low dose rates there are few concurrent errors. It would be very surprising if this had no impact on repair success rate. There is a very high base rate of errors(oxygen, can't live with it, can't live without it). If you can stimulate repair mechanisms just a tiny smidge you can undo more than the damage caused by the radiation while still being less than 100% effective at repairing errors. We have an actual proof of concept for this from another stressor; exercise. Exercise causes a massive amount of oxidative damage and should by all expectations be a carcinogen, but it isn't, because it also massively upregulates DNA repair mechanisms. Sure you do. A single error is a source of contribution to cancer. If you plot amount of exercise versus cancer risk, you get a graph showing more and more exercise reduces cancer. If you plot a graph of amount of radiation versus cancer risk, you get a graph showing more and more radiation increases cancer. LNT incorporates the Dose & Dose Rate Effectiveness Factor to account for those terms. "If you plot amount of exercise versus cancer risk, you get a graph showing more and more exercise reduces cancer." An open admission that repair doesn't have to be 100% effective to disprove LNT. "If you plot a graph of amount of radiation versus cancer risk, you get a graph showing more and more radiation increases cancer." The only regime in which this has been demonstrated is massive doses(~100 mSv) and dose rates. I.e. not the regime this article is talking about. Using LNT as a regulatory precaution is one thing; but pretending that the model is a good fit for reality at low doses and dose rates, where simple haven't been able to measure the effect, is dishonest. The dose rate effectiveness factor is a grudging admission that LNT is wrong. If you still refer to it as LNT you are being dishonest; drop the L.
No it isn't an open admission. LNT is about cancer incidence in populations exposed to radiation. People who excercise still get cancer, and some people who don't excercise will not get cancer. Excerise reduces the risk, radiation increases the risk to a population. "If you can stimulate repair mechanisms just a tiny smidge you can undo more than the damage caused by the radiation while still being less than 100% effective at repairing errors"
You should study more radiation dose studies. Plenty have been done on human populations, animal populations, cellular level, etc. at low doses. If the DDREF was not included in LNT, the incorrectly modeled dose response would be super-linear. W.L. Chen, et al, Journal of American Physicians and Surgeons Volume 9 Number 1 Spring 2004 An extraordinary incident occurred 20 years ago in Taiwan. Recycled steel, accidentally contaminated with cobalt-60 (half-life: 5.3 y), was formed into construction steel for more than 180 buildings, which 10,000 persons occupied for 9 to 20 years. They unknowingly received radiation doses that averaged 0.4 Sva collective dose of 4,000 person-Sv. The data on reduced cancer mortality and congenital malformations are compatible with the phenomenon of radiation hormesis. The experience of these 10,000 persons suggests that long­term exposure to radiation, at a dose rate of the order of 50 mSv (5 rem) per year, greatly reduces cancer mortality. This has been thoroughly documented. My curiosity: do the bodies 'repair mechanisms' deplete with long duration exposure to radiation or become more proficient at compensating for it? Given constant background radiation & fluctuations from solar events, electromagnetic & atmospheric change etc, our entire evolutionary history we have sustained constant exposure to radiation so I wouldn't be surprised if we're underestimating natures longterm coping mechanisms. I think studies have shown that exposure to continues low dose radiation of Radon on high-Radon living areas does increase the risk to develop lung cancer. I think that when we are talking about (ionizing) radiation, it might be important to divide that study to different classes of that radiation: Alpha, Beta and Gamma. I think these might have different exposure versus effect rates. For example cosmic radiation, as far as I know, can be assumed to be gamma. Radon in the lungs exposes to alpha radiation. Some other sources might expose one to beta variety. That's what effective dose takes into account; whether the source is alpha, beta or gamma particles. A gray is a gray, it really doesn't matter where the dose comes from, just where it goes and for how long.